Cat climbing trees are great for cats and cat owners for a number of reasons. For cats they can prove invaluable because they cater to their natural instinct to climb up into high places. They also give cats a place to play, allowing them to relieve stress and boredom. For the cat owner they are also extremely useful, as they will keep your cat happy and amused, and will give your furniture a break from being wrecked and clambered all over. Outdoor cats have more opportunity to climb, since there are trees and fences around, but a cat that's stuck indoors all day isn't quite as lucky. Cats cannot control their instinct to climb and scratch and if they do not have an appropriate place to do this then it is your furniture and belongings that will most likely suffer! A cat tree is something that can benefit your pet and your home enormously. These cat climbing trees are also known as cat gyms or cat towers. They come in a range of different varieties, and some come with fun features like little hanging toys that cats can play with – something that will keep your pet amused for hours! Not only do these cat climbing trees provide fun and stimulation for your cat, but they're also great for exercise too. The fancier ones have tunnels built into them or a hole for the cat to hide in. Some even have an enclosed litter box. 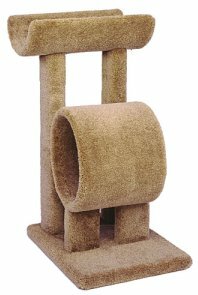 Cat climbers are made to have multiple platforms and climbing poles, which are covered in carpeting. The poles are often sisal posts which are perfect for scratching. The size of the cat climbing tree will be determined by the number of cats you have. For a single cat there are many smaller trees and gyms to choose from. For multiple cat households you can get some stunning towers that all of your feline friends can enjoy without getting under one another's paws! The cat tree is constructed using tension poles that secure the tree in place for your pets' safety. Why does your cat love climbing so much? A cat's body is primarily built with climbing in mind. With their lean muscular body and athletic prowess, jumping up from 3-7 feet in the air is an easy feet for a cat. In the wild, cats need to climb up into high places, like into the trees to escape from larger animals, or to hunt down their prey. Climbing is something that is instinctive in a cat, and even if you have an indoor cat it is important that you provide your pet with the means to do this. What are the benefits of cat climbers? They give your cat a place to play, enjoy fun and stimulation, enjoy the fun and adventure of climbing, and benefit from regular exercise. They prevent your furniture from being scratched and damaged. Since most cat trees come with a scratching post built in, your cat can use it to scratch for fun, and to maintain the proper shape of his claws. Access to a cat climbing tree will help relieve stress and boredom for indoor cats.